Hi again! Tonight I want to talk about the remake of the movie I reviewed a few nights ago, On The Beach. This one was made 41 years later, but there are many similarities between the two. “The End of the World, the Beginning of Hope.” Wait, that doesn’t make any damn sense! The main premise of the movie is still the same: the northern hemisphere has been destroyed and the fallout is coming down to Australia to kill everyone. Some details are different, though. In this version, it was a war between the US and China, not the USSR. Some of the places in the US where the sub goes to try to find life have been changed. Some of the effects are better (this time they were actually able to make San Francisco look like it was destroyed, which was apparently too difficult to do with f/x technology in 1959), but some are worse, actually (like the weird spinning camera). The acting is sometimes better (the Aussie guy and his family are maybe more convincing than the guy from Psycho, at least in terms of seeming Australian…in fact, basically all of the Australian actors are better than the ones in the original), and sometimes it’s worse (Armand Assante plays an über-macho American sub captain, but Atticus Finch managed to convey more presence with subtlety and class). There are also more details in this version, which I actually liked. I was made for TV, though, so I guess they could take that luxury. The tone is mixed. The original was more somber, which may have had to do with the black and white film. This one looks and often feels like a soap opera, and that makes you almost think that it may pull a happy Hollywood ending out of nowhere at the very end. To their credit, though, they don’t resort to that, and the end is just as sad as the original, if not more so. The scenes with the Aussies and their family are more detailed here, and they’re much more effective as you see the hopelessness of it all, even if they try to die with dignity. So what’s the overall verdict? Well, I probably shouldn’t have watched it right on the tails of the original (and other nuclear death movies), since I may not have had a chance to cleanse my movie palate. I guess I can say I “enjoyed” this, with the same caveat that it’s not really possible to enjoy them. I guess “appreciate” would be a better word. It does a good job of making you seem powerless and making everything seem bleak, but mixing in a dash of hope since we’ve not actually lived through all the crap happening in these movies. We can only hope that movies like these will help function as deterrents to keep us from destroying humanity. Nostalgia Factor: 3/17 I guess it made me think of fashion from about 14 years ago, but that’s not really a positive thing. Scariness of the Nuclear Scare: 16/17 Since it’s been thoroughly updated in many ways, this one may actually be scarier than the others. It’s just that the way it’s presented isn’t 100% convincing since it’s too flashy. This very-similarly-titled movie was also released in 2000, making it hard to find pictures for the Aussie TV soap opera movie. But since it featured Leonardo DiCaprio–who I don’t care for–I decided to put up this pic of his co-star. 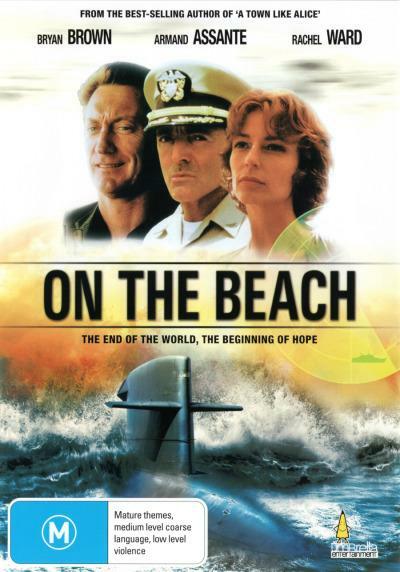 This entry was posted in Review, Ryan, Sitzman and tagged 2000, Armand Assante, Atomic Film Fest, Disaster, Movie, Nuclear, On The Beach, Review, TV Movie, War by Ryan. Bookmark the permalink.